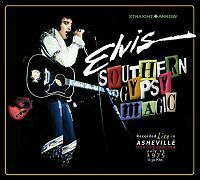 This double CD features the July 23, 1975 Asheville show, plus bonus rarities from July 22 and 24. The show was originally issued on Gyrating Asheville (1997), but Straight Arrow obtained a better tape source; a two microphones recording. Thus there is noticeable ambience, due to channel separation. And, for the first time, the show is complete with no edits. Asheville was the final city on his July 1975 tour, with three consecutive nights sold out at the newly-built Civic Center. The middle show on July 23 offers a number of unexpected inclusions like 'Turn Around, Look At Me', 'Shake A Hand' and 'Promised Land'. Bonus selections includes 'You Don’t Have To Say You Love Me'and 'Memphis, Tennessee'. The release is topped off with images from July 23, plus a photo each from July 22 and 24.